Brighid’s Kitchen has a monthly giveaway for one $50 Amazon gift card and a coupon to get one of our products for free! June’s giveaway will be for one $50 Amazon gift card and a coupon to get a set of 12 Brighid’s Kitchen Silicone Baking Cups for free. You also now have a choice of multiple colors – multicolor, green, pink, yellow, purple, and orange – and we are now live on Amazon.co.uk, so UK residents are now eligible to win! Disclaimer: No purchase is necessary to enter. Void where prohibited by law. The odds of winning are based on the number of entries received. Open to US and UK 18+ only. Confirmed Winner(s) (by Rafflecopter) will be contacted by email. Winner(s) have 48 hours to respond before a new winner is chosen. This event is in no way administered, sponsored, or endorsed by, or associated with, Facebook and/or Twitter, Google, or Pinterest. May’s giveaway will be for one $50 Amazon gift card and a coupon to get a set of 12 Brighid’s Kitchen Silicone Baking Cups for free. Current email subscribers would have received an email this morning with a link to download the book. If you would like your own copy and are not already an email subscriber, please go ahead and sign up using the form on the right. You will also receive a 20% off coupon that you can use at any time for any of our products. 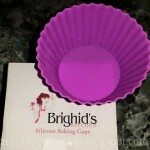 We will also be including this soon with purchases of our Silicone Baking Cups on Amazon. P.S. You can also follow us on Facebook, Twitter, Pinterest and Google+ where we post three recipes a day that you could try out with our silicone baking cups, including cupcakes, muffins, puddings, meatloaf cupcakes, icing tips, gluten-free recipes, and more. We just wanted to give you a final update on our March/April Giveaways. First, four giveaways have ended since the last update. 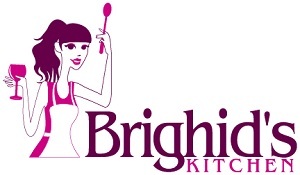 Congratulations to Sharyl, Marnie, Sandra and Amanda for winning the Stay At Home Life, So Simple Stephanie, Deliciously Savvy and Brighid’s Kitchen March Giveaways! Second, our last blogger review and giveaway is being hosted by MaPa Reviews and ends on Friday, 4/24 at 6pm Eastern time. 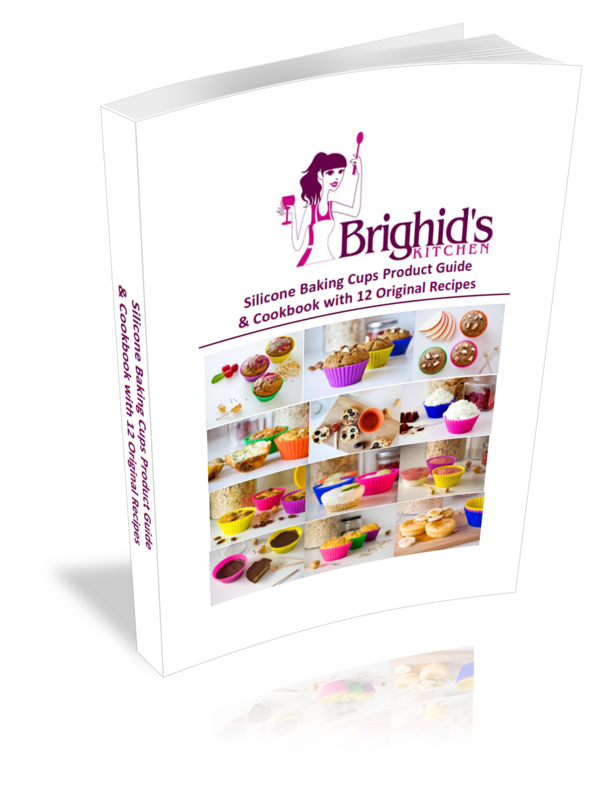 Third, for those that entered and have not won, but would still like their very own set of Brighid’s Kitchen Silicone Baking Cups, we are doing a limited time 30% off sale that runs from Wednesday April 22nd to Sunday April 26th. Just use coupon code NZQB3RTU at checkout on Amazon! 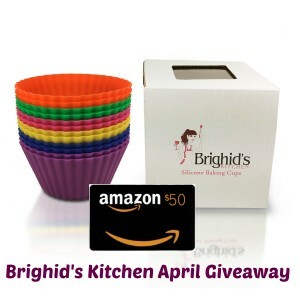 Last, the monthly giveaways are continuing with April, and you have until Thursday, April 30 (next week) to enter and win a $50 Amazon gift card a free set of Brighid’s Kitchen Silicone Baking Cups. There are no restrictions on how many monthly giveaways you can enter. Please follow us on Facebook, Twitter, Pinterest and Google+ where we post three recipes a day that you could try out with our silicone baking cups, including cupcakes, muffins, puddings, meatloaf cupcakes, icing tips, gluten-free, and more. April’s giveaway will be for one $50 Amazon gift card and a coupon to get a set of 12 Brighid’s Kitchen Silicone Baking Cups for free. We just wanted to give you an update on several reviews and giveaways we have going now and upcoming during March and April to give you a chance at winning. First, two more giveaways have ended and winners picked! Congratulations to Maureen and Dandi for winning the Lavende & Lemonade and Lavender & Cream Giveaways! Second, a new blog and video review posted last week on the K&M Stay At Home Life blog, with a giveaway that ends today. Sign up before it’s too late! Third, another new review & giveaway by So Simply Stephanie, it ends April 4th! 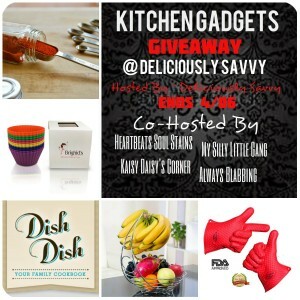 Fourth, the Kitchen Gadgets Giveaway by Deliciously Savvy continues until April 6th. Sign up now to get a chance to win a set of Brighid’s Kitchen Silicone Baking Cups, as well as some other kitchen items that include a measuring spoon, fruit basket, silicone cooking gloves, and a Dish Dish recipes one year membership with cutting board. This is also your last chance to enter our March Giveaway on our website that ends today, March 31st. Not only can you win a free set of Brighid’s Kitchen Silicone Baking Cups, but we threw in a $50 Amazon gift card! We will do a giveaway every month, and there are no restrictions on how many monthly giveaways you can enter. Last, we should have more giveaways coming, and we will keep you informed. Please also follow us on Facebook, Twitter, Pinterest and Google+ where we announce giveaways as they start, so you don’t miss any! We also post three recipes a day that you could try out with our silicone baking cups, including cupcakes, muffins, puddings, meatloaf cupcakes, icing tips, gluten-free, and more. First, two more giveaways have ended and winners picked! Congratulations to Shaida and Charity for winning the Nana’s Deals and More and the Mommy on the Money Giveaways! Second, we are part of a new Kitchen Gadgets Giveaway by Deliciously Savvy that just started today. Sign up now to get a chance to win a set of Brighid’s Kitchen Silicone Baking Cups, as well as some other kitchen items that include a measuring spoon, fruit basket, silicone cooking gloves, and a Dish Dish recipes one year membership with cutting board. Ends April 6th, 2015. Third, the Lavende & Lemonade tried out our baking cups with a Whole Grain Apple Oatmeal Muffins Recipe and is hosting a giveaway for our baking cups that ends on Sunday, March 22nd – so only a couple days left to enter! 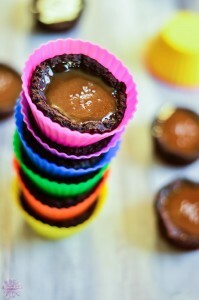 Fourth, a blogger that is in our local Philadelphia area, Kelley from Lavender & Cream, tried out our baking cups with a Gluten Free Chocolate Thumbprint Cupcakes with Whiskey Salted Caramel recipe and is also hosting a giveaway that ends on Tuesday March 24th. You can also still enter our monthly giveaway on our website that ends on March 31st. Not only can you win a free set of Brighid’s Kitchen Silicone Baking Cups, but we threw in a $50 Amazon gift card! We will do a giveaway every month, and there are no restrictions on how many monthly giveaways you can enter. Last, we have several other giveaways still to come, and we will let you know the next set of those in an email next week. However, please also follow us on Facebook, Twitter, Pinterest and Google+ where we announce giveaways as they start, so you don’t miss any! We also post three recipes a day that you could try out with our silicone baking cups, including cupcakes, muffins, puddings, meatloaf cupcakes, icing tips, gluten-free, and more. We just wanted to give you an updated on several reviews and giveaways we have going now and upcoming during the month of March to give you a chance at winning. First, two giveaways have ended and winners picked! Congratulations to Margot and Sarah for winning the Lemons and Laughs and Chrissy’s Critiques Giveaways! Second, we had another review and giveaway from Nana’s Deals and More that ends in 2 hours, so be sure to hurry to get a chance to win! 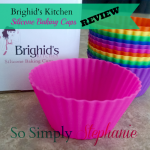 You can also check out her video review for a look at the Brighid’s Kitchen Silicone Baking Cups out of the box. 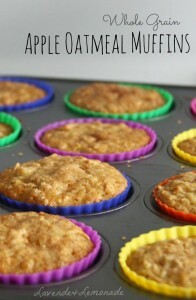 Third, the Lavende & Lemonade tried out our baking cups with a Whole Grain Apple Oatmeal Muffins Recipe and is hosting a giveaway for our baking cups that ends on Sunday, March 22nd. Fourth, a blogger that is in our local Philadelphia area, Kelley from Lavender & Cream , tried out our baking cups with a Gluten Free Chocolate Thumbprint Cupcakes with Whiskey Salted Caramel recipe and is also hosting a giveaway that ends on Tuesday March 24th. 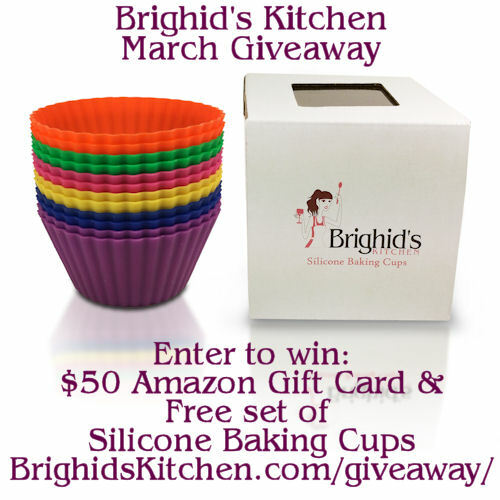 Next, you can still enter the Mommy on the Money blog review and giveaway that ends on Monday March 16th at 11:59 PM PST.This giveaway is for one set of our Brighid’s Kitchen Silicone Baking Cups and a $25 Amazon Gift Card!